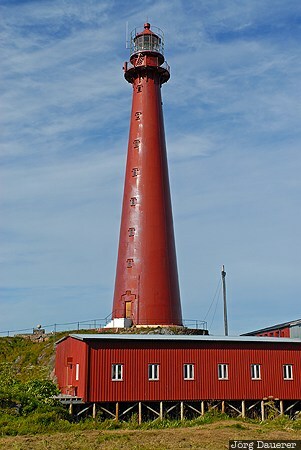 The red Andenes Lighthouse (Andenes Fyr) in front of a cloudy sky. Andenes is at the northern tip of the island Andøya which is the northernmost island in the archipelago of Vesterålen, Nordland, Norway. This photo was taken at noon on a cloudy day in August of 2010. This photo was taken with a digital camera.